Subbing turkey for beef isn’t all it takes to make a healthy turkey chili. Some recipes call for commercial seasonings, which shoot sodium levels sky high. So, without sacrificing flavor, we’ve perfected a recipe guaranteed to be your new favorite comfort food. 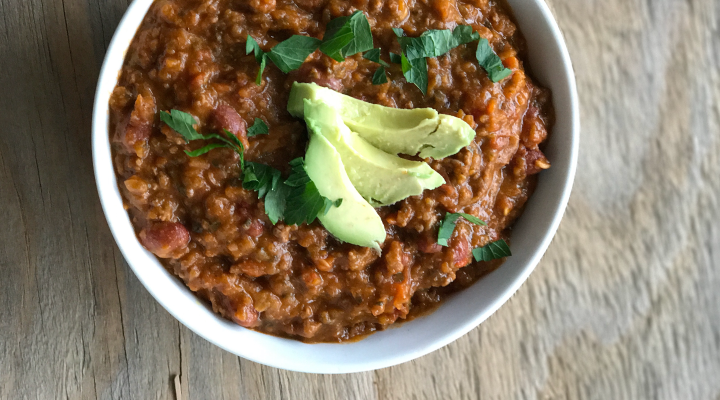 This healthy turkey chili may seem too good to be true. But take it from the recipe taste tester (me)—it’s not. This lean meat is full of phosphorus, a mineral that strengthens both bones and teeth. Beans are notorious for fiber and protein, but they’re also rich in antioxidants. They can help reduce gum inflammation. Fill up on fiber with these orange all-stars. Carrots also contain vitamin A, which can help prevent dry mouth. Healthy toppings of choice: Non-fat sour cream, avocado slices, low-fat cheese, etc. Prep and cut all of your veggies. Heat a large pot over medium-high heat. Coat the pot with cooking spray. Cook ground turkey, stirring often, until no longer pink. Add tomato sauce, diced tomatoes, beans, diced carrots, diced bell peppers, garlic, and spices. Stir and bring to a boil. Once boiling, reduce heat to low and cover for 6-8 hours, stirring every few hours. Add your favorite healthy toppings and enjoy! Regardless of which season you choose to cook, make it chili in your kitchen! For more comfort food, check out this slow cooker elk stew recipe.